Editor’s Note: One of the great things about camp is the healthy, active lifestyle. Even if you’re not an athlete, you move around a lot, whether you’re playing or just getting from one place to another. All that spent energy enhances mood, mental alertness–and isn’t bad for looks, either! In our description of camp, the H in “HEARTS“ stands for Healthy atmosphere. It’s been learned that the average American youth spends 6 to 8 hours a day in front of a screen, whether the screen is a computer, television, or cell phone. 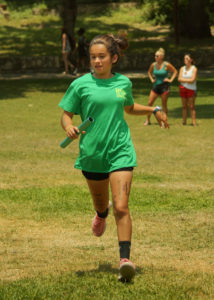 By leaving electronics unplugged, camp allows girls to move more. We eat healthy meals, snack little, walk a lot, run, laugh and play. The E is for Engaging all senses.We do our best learning not when we sit and listen, but when all the senses are engaged. At camp we don’t just listen, we DO. That stimulus-rich environment is the best for soaking it all up! 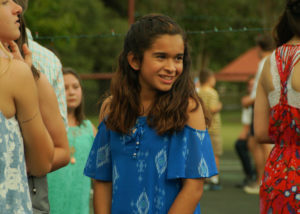 Camper Jessica A says that staying busy and active, as well as trying new things are some of the biggest reasons she loves camp. We could tell you how amazing Heart O’ the Hills Summer Camp for Girls is, but that would be no fun. So we asked our Heart Campers to share their experience about camp. Periodically we post a camper’s “Heart Story”. We hope you enjoy reading how camp makes a difference in girls’ lives every day. Today’s story is from Jessica A, who will be here for her fifth summer in 2018. She loves her tribe, archery, kickboxing, and pickleball. And then there’s swimming, Mission Impossible, the Stewart dance, and just about everything else! Her counselors say that Jessica is brave, respectful, and a good friend to all. All dressed up for the Stewart dance! “Being at camp allows me to do things I never would do back home. Electronics distract me from what’s really happening around me and what’s important.At home I lie around constantly playing on my cell phone. At camp I’m active, engaged and at one with nature. I’m able to feel the sunshine warm upon my face while creating long lasting friendships.”If you would like to share your Heart Story send it via Facebook messenger or email. We can’t wait to read it!